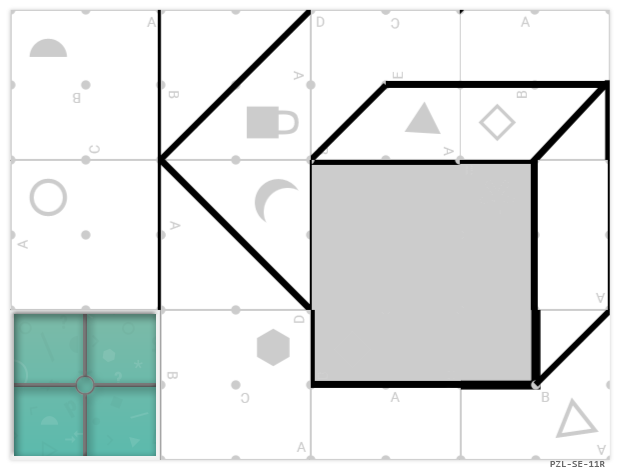 I'm going to come right out and say it: I'm kinda bored of making puzzles, but I still want those sweet, sweet imaginary internet points, so I'm phoning it in this time with a flat-pack rebus I bought at a puzzle warehouse. The only thing is, I can't really be bothered putting it together... Rather than completely waste my money though, I'm just posting it here, in case someone else wants to finish building it. Above is a bog standard PZL-SE-11R puzzle socket that this rebus is compatible with (as I'm sure you've seen a million times before), and below are the instructions... Underneath that, are the puzzle components themselves. So, yeah... Feel free to finish putting it together, and then solve the resulting rebus. The rebus resolves to a short and well known phrase. If you did everything correctly, there may have been an instruction that seemed arbitrary, or even unnecessary... It was, in fact, essential. I have made a cube of the first net in a 3D viewer. I advise clicking on 'view in 3D'. To start with, the top tells us we need to use a thin pen and not a thick one, and a paint fill tool. 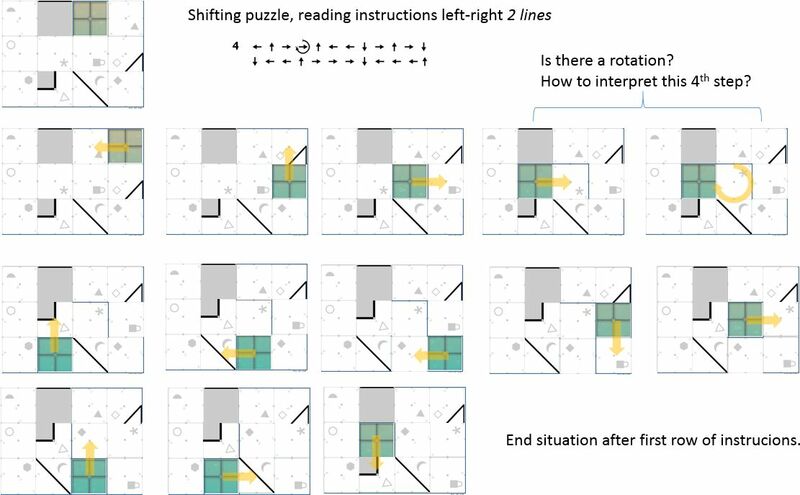 So it looks like we have to deduce which cubes are the correct ones. 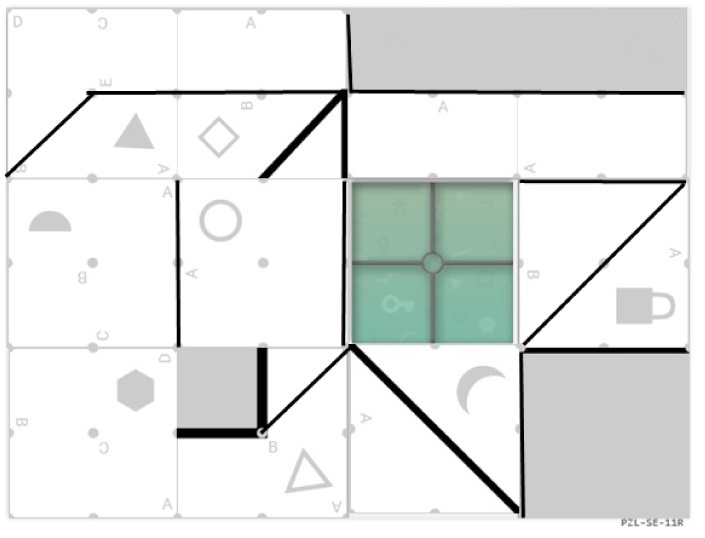 1. because the orientation of the black V relative to the grey triangle doesn't match the corresponding 3-piece. 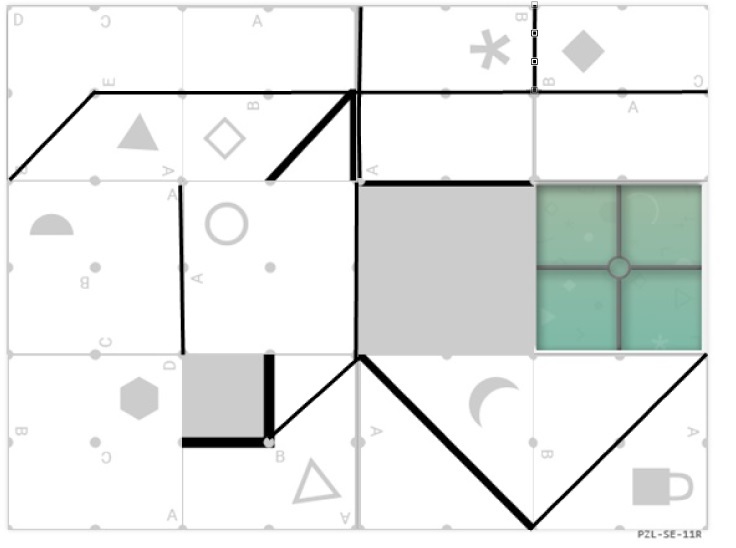 4. because the grey side would need to be opposite of the black diagonal after assembling the 6-piece. 5. because when the grey hexagon and the black right angle are adjacent as pictured, the top of the cube would be the grey circle. 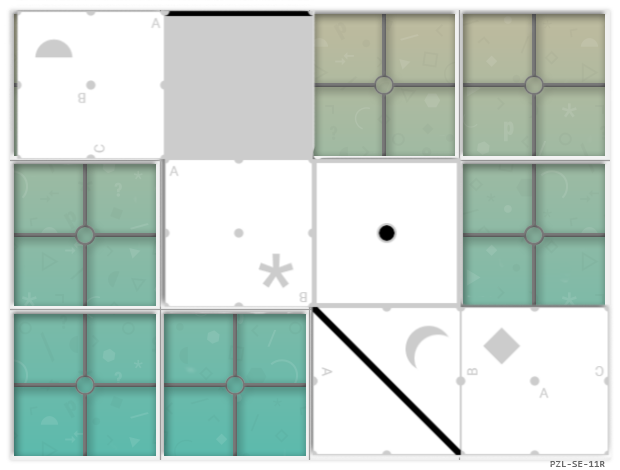 6. because the orientation of the black diagonal relative to the gray square doesn't match the 6-piece. So it can only be RS-02 or RS-03. The top face of the left cube goes in the top left corner as demonstrated by the diagram and the top face of the right hand cube goes in the bottom left corner. 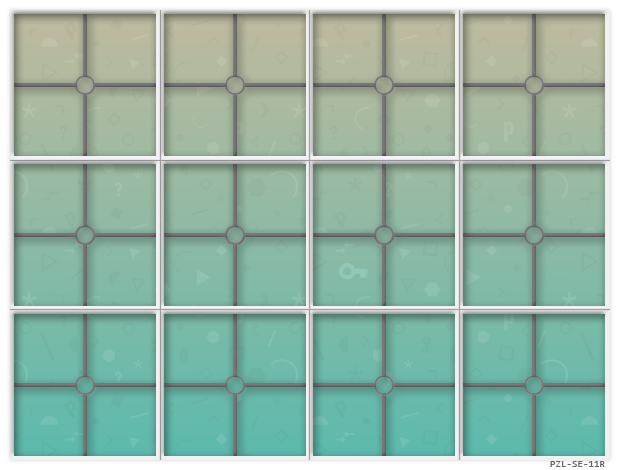 So what if this was a Sliding Puzzle? 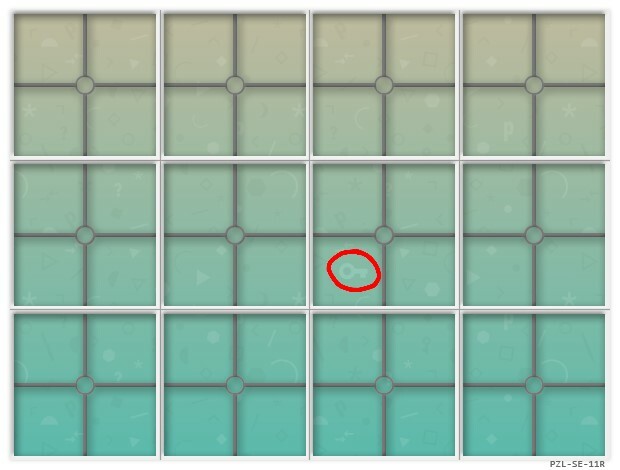 In the first step, we draw from the dot marked "A" in the semi-circle tile, to the dot marked "D" in the hexagon tile. 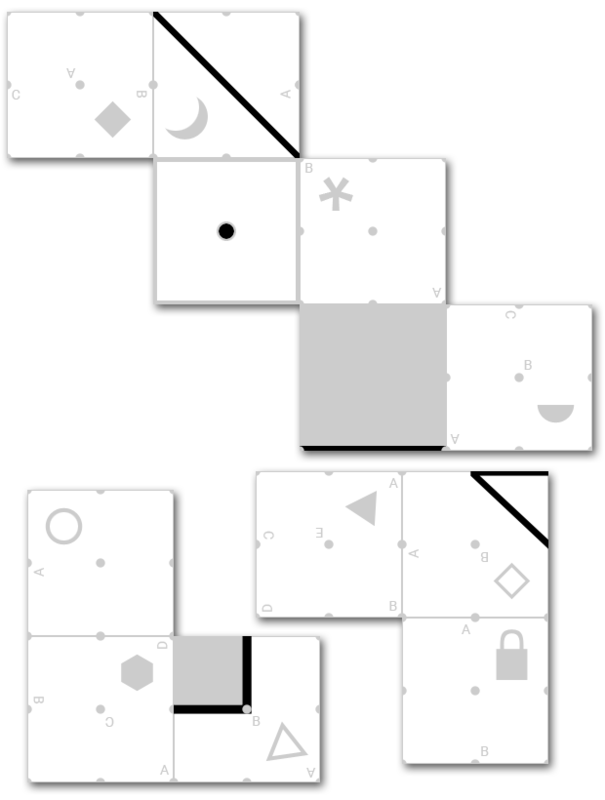 The second step shows that we have to connect the two triangle tiles using the dots in their centres. 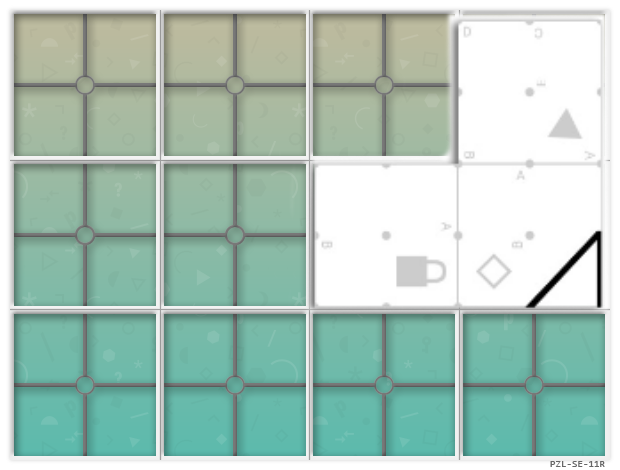 As mentioned above, the arrows are the directions we have to slide tiles into the empty space. As with step 3, we have two lines to draw. 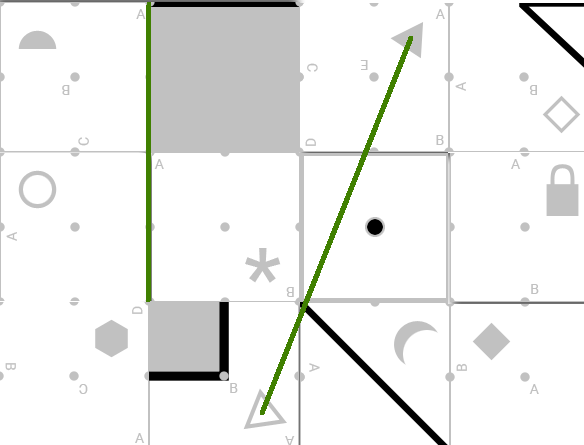 The first runs from the lone dot marked with an "E" (on the filled triangle tile), through the centre of the tile represented by the hollow diamond, and continuing off the edge (note that there is no dot at the end of the dashed line). The second line shows a line drawn between two large shapes. These shapes are the top quadrants of an asterisk and a solid diamond, indicating we should draw a line from the top dot between these tiles and their shared centre dot. 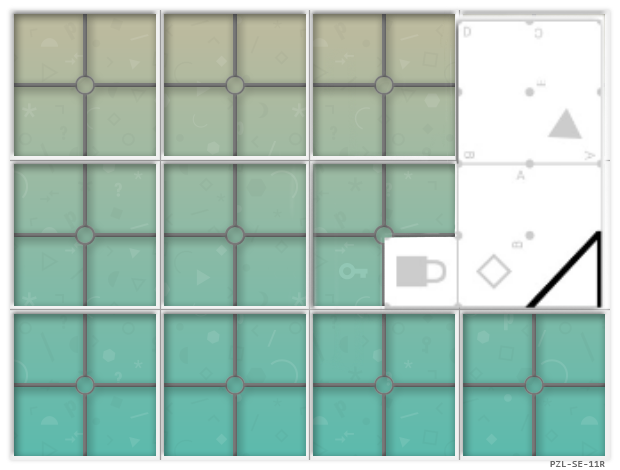 There has only been one previously rotated tile so we have to rotate that back by 1/3 of what it was originally rotated (i.e back 1/4 of a revolution). @ffao showed some brilliant thinking to solve this. RS-01 because the orientation of the black V relative to the gray triangle doesn't match the corresponding 3-piece. RS-04 because the gray side would need to be opposite of the black diagonal after assembling the 6-piece. RS-05 because when the gray hexagon and the black right angle are adjacent as pictured, the top of the cube would be the gray circle. 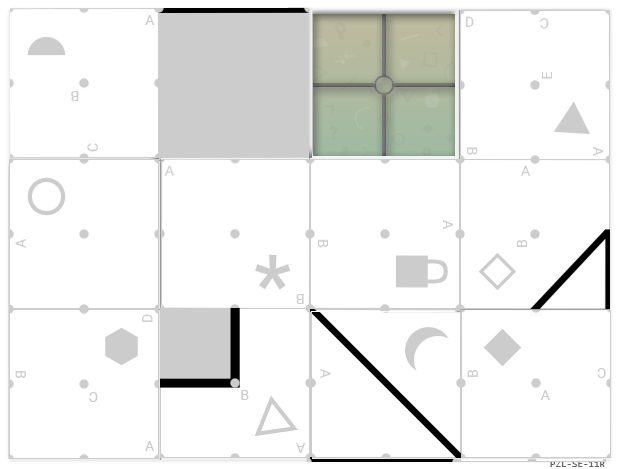 RS-06 because the orientation of the black diagonal relative to the gray square doesn't match the 6-piece. 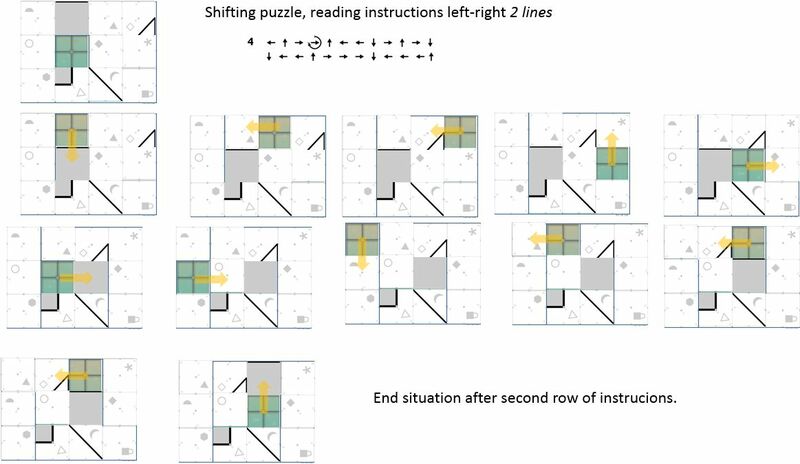 Step 2 seems to say to take the two cubes as pictured in step 1, and place disassembled pieces in the grid, with the top face of the left cube in the top left corner, the top face of the right cube in the bottom left corner. 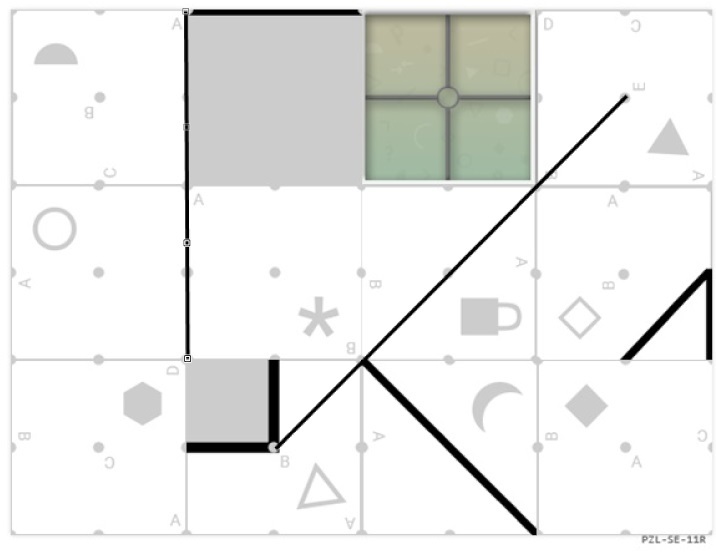 Assuming we don't mirror the pieces, the 6-piece needs to use the top left and bottom right corner, hence must be the left cube. This would rule out RS-02, leaving RS-03. The gray hexagon goes bottom left, the lock ends up at the right edge, above/right of the key, though I'm not sure that's good enough. For step 3, I'm now tempted to draw a line between the dot next to the A in the square with the semi-circle to the dot next to the D in the square with the hexagon. Similarly, the six-pointed star seems to be the superposition of both triangles, so let's connect them. I'm not so sure the second line is good, but here goes.